Why You Should Opt for Scuba Diving in the Riviera Maya? For all those looking for a unique scuba diving experience, Riviera Maya is one place in the world which can be called the perfect destination for scuba divers because it is home to many beautiful locations that you can visit during your dive trips including the cenotes. In Mexico, you can find freshwater cenotes, which are unlike anything that you have seen on other dive sites. Why divers consider Riviera Maya scuba diving the most amazing is that it gives one the opportunity to see the beautiful sea life. The area is home to many colorful and healthy reefs along with popular dive sites. The varieties of coral are habitat to a dazzling array of marine animals. The most popular of these are the endangered sea turtles. If you plan your trip from May to September, there is an excellent chance that you’ll see the turtles on the beach and in the water. In the winter months, you can see schools of fish running through the Riviera Maya waters, offering divers the experience of swimming with the fastest fish in the world. For all those who are fond of daring animals, Riviera Maya offers ample opportunities to dive with sharks. For all the brave hearts it will surely be a thrilling experience. Other wildlife you can spot include rays, octopus, starfish and squid along with the endless variety of common colorful fish. Rock Formations – When scuba diving in Riviera Maya, you will see that there are many beautiful rock formations which are far difficult to see from the surface of the water. The formations were created over thousands of years. Scuba diving in cenotes lets you discover the world of natural beauty. Water Visibility – The freshwater of the Riviera Maya offers clear visibility which means that you will be able to see clearly throughout the water. It is a unique experience compared with diving in salt water. Other cave systems in different parts of the world have competing water sources that feed into the caves. But in Mexico, the freshwater is filtered through the cenotes and it is very clear and crisp. Stunning Vistas – If you happen to opt for cenote diving and if there is a bit of sunlight entering into a large room filled with water, you will see the cenote cave in a totally different way. It gives one the feeling that this is a whole different world. The light that through the water to light up the caverns is so very breathtaking. Buoyancy and Scuba Skills – Cavern diving is done in a small confined space. Therefore, you need to take care that you are all set with your buoyancy so as to move comfortably through small passages. In many places in the cenotes, there are rocks overhead and the areas are completely filled with water. So, you need to be comfortable enough with your buoyancy in order to handle yourself appropriately without running into the overhead rocks or side walls. Hand Signals and Safety Guidelines – The professional guide will brief you about the unique hand signals and scuba guidelines that need to be taken care of before you get into the water. To make sure that the air consumption is appropriate for the length of the dive, the guide will also tell you about the rules that need to be abide by. Moreover, cenote diving is usually conducted in a small group. To make the experience more personalized, you can explore the cave in a safe and fun situation. The Mexican Caribbean that lines the coast of the Riviera Maya and Costa Maya makes Riviera Maya scuba diving the much admired activity amongst adrenaline junkies across the world. 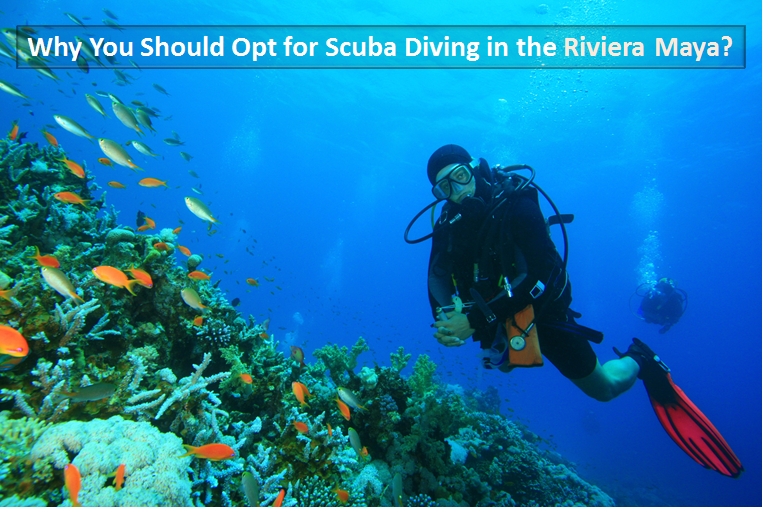 Wait no further and get ready for a fun-filled and enthralling experience in scuba diving in Riviera Maya.